Nutella was first imported to America from Italy in 1983. In the last decade its popularity has risen to cult like status. The world has gone crazy after seeing McDonald’s in Italy release a sweet Nutella bun cross doughnut. McDonald’s has not confirmed if this Nutella dessert will make it to the States McDonald menu, but if did, it would no doubt be a best seller. The Nutella doughnut is another popular dessert that elevates Nutella from just a sandwich spread to something that is insanely delicious. To explore how to use Nutella in to die for desserts, we have compiled a list of the best recipes ever found. Making your own Nutella doughnuts is actually quite easy and a lot cheaper than buying a dozen. And lets face it – one is never enough! 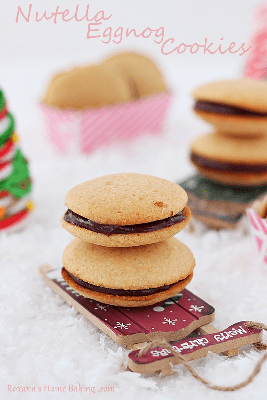 Nutella Christmas recipes should be part of everyone’s Christmas traditions. This recipe combines eggnog and Nutella to make the most amazing Christmas cookies. See http://atreatsaffair.com/nutella-eggnog-cookies-recipe/ for the full recipe. Have you heard of three sweeter words than Smore’s Nutella Pizza?! This Nutella recipe is good any time of the year, good whether indoors or outdoors, good whether for dessert or dinner! Easily made to suit wheat allergies by simply swapping out the wheat base for a gluten free base. There is virtually no-one in the world that could say no to this Nutella delicacy. This Recipe is from Nutella’s own website and its a simple classic that shouldn’t be underestimated. There are many fancy Nutella recipes that require much preparation, baking and general hands on making. This recipe is easy, simple and divine. Watch me whip, whip, watch me stuff my face, face! This Nutella Cool Whip Pie makes the list due to the fact it is easy to make, looks stunning and tastes like Nutella Heaven. And one other fact about this pie – it also has Ferrero Rocher’s in it. Could there be any better two chocolate representatives than Nutella and Ferrero Rocher’s? And here they both are – together at last! Go immediately and without hesitation to the website below for all the recipe deets. NextMoving House at Christmas Time?